An albino bottlenose dolphin who was spotted swimming along with his pod between the coasts of Croatia and Italy made international headlines this week. Nicknamed "Albus" by the research team that found him, the snow-white animal is extremely rare - there are only about 20 dolphins like him in the world. "This appears to be the first albino dolphin spotted not only in the Adriatic Sea, but in the entire Mediterranean," a spokesperson for Plavi Svijet, a Croatian environmental organization, told The Croatian Times. He added that the dolphin seemed healthy and was hunting along with non-albino animals. See this post for photos of the iconic dolphin. While he is rare, this dolphin isn't the only famous albino dolphin. 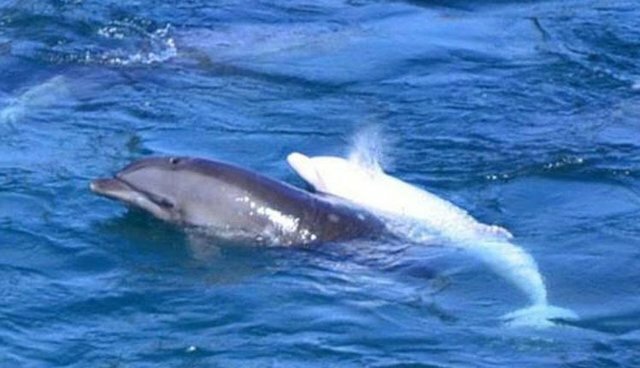 In fact, another white dolphin (pictured above) made even more headlines last year when she was captured in the annual dolphin drive hunts that occur in Taiji, Japan. Still a juvenile, the dolphin was taken from her mother and transferred to a tank at the local Taiji Whale Museum. The dolphin recently spotted near Croatia is probably safe from fate, though. Thanks to animal rights activists, dolphin captivity is banned in Croatia (among other places). Ric O'Barry, the animal advocate who dubbed the captured albino dolphin "Angel" last year, said that he's now in Japan to publicize the fate of captive dolphins like Angel. "It's a shame that Angel didn't have the same benefits as the caring people in Croatia," he told The Dodo in an email. "Angel is constantly on my mind." The yearly hunt, during which dolphins and porpoises are herded into a cove and either brutally slaughtered for their meat or captured for captivity, is set to begin again in just a few days. See this post for everything you can do to end the dolphin drive hunts in Taiji.